So, clearly, productivity has been really low this month due to other projects – but I can say that page 79 is very close to done (inkwork viewable here / pencilwork viewable here) and this month’s Patreon Ranger Bonus sketch is on its way. I’ve been really feeling this part of the world’s backstory lately, so here’s something else about these two in the meantime! 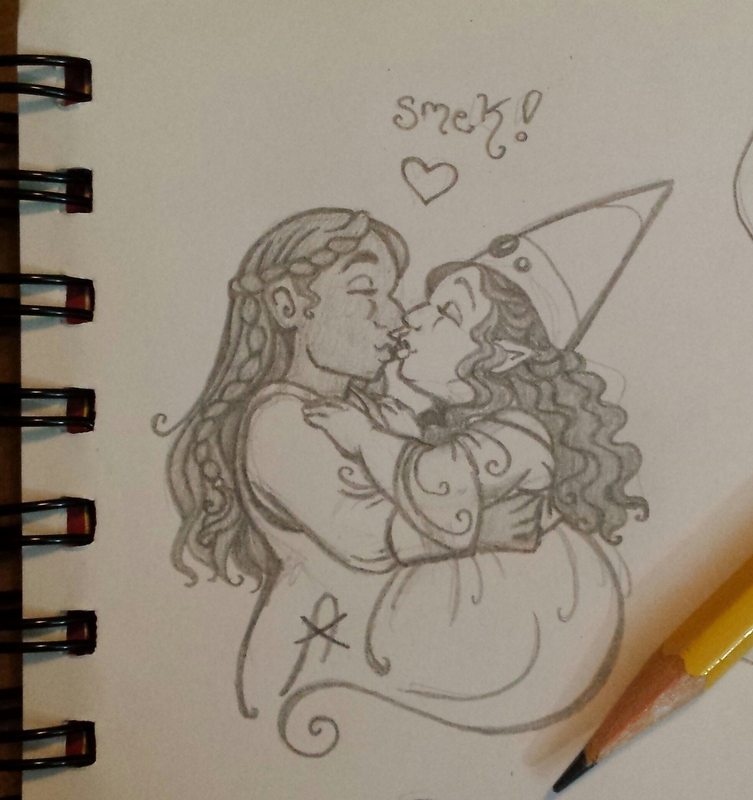 A Tockverse Gnome and Tockverse Dwarf sharing a sweet kiss. The rest of the piece is about the gems and minerals market where Gnomes and Dwarves have the vast majority of their interaction, and why that is. But that’s a tale for another time. Happy Valentine’s Day, everyone! May we all be grateful for the Love in our lives, whatever forms it takes. 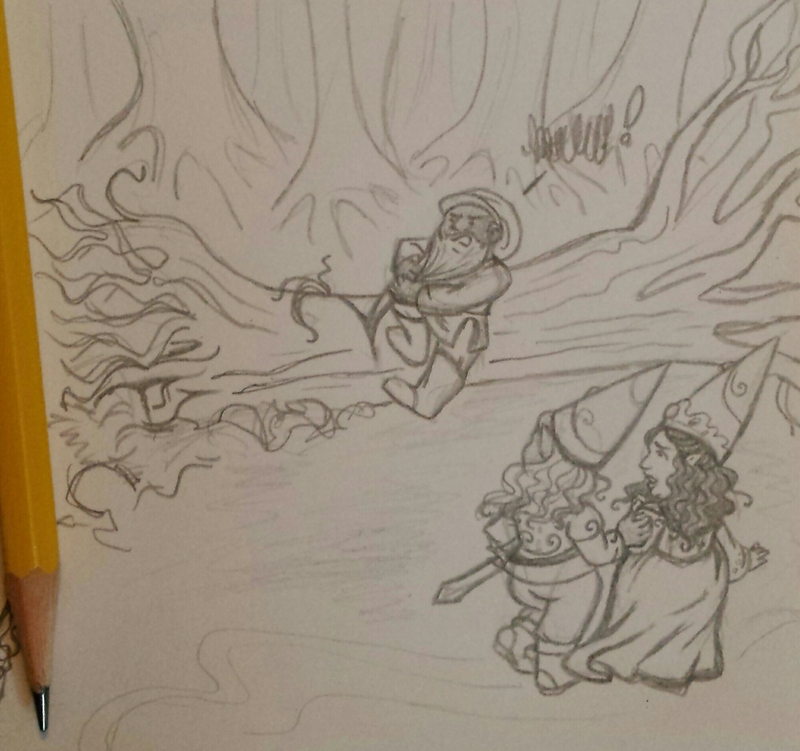 Prompt – Faerie Tale (and bonus sketch!). Full prompt list linked in the About tab above. Since this hiatus is taking a bit longer than I’d hoped, I put up a poll on my deviantART page recently, asking if anyone would be interested in seeing something special as a bonus until the next page is done. Most everyone voted yes (thank you! ), so here that is. NOTE: the following image contains very slight spoilers, for the setup of the world itself (not the overarching plot). I did this illustration a while back in order to get out of an art slump, and held off on posting it then in interest of showing it to you waaaaaay later, but you are all amazing for hanging in there and waiting so long for new pages, so here it is now! These women are versions of specific characters from two popular fairy tales (well, one more popular than the other, but I don’t want to give too much away). That’s all I can say for now, except to mention that they will be referenced later in Tock’s story. Thank you all again for your patience. I hope to be back to regular updates within a month.